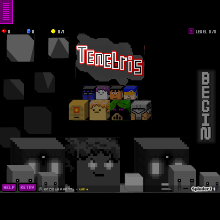 Controls: Arrow keys to move. Mouse to select character, and when they spawn, click on them.---------------------- The full version, finally out. This is the first game, and so the story begins here. Shadowdroid has manifested in a physical form made from teenage angst and edginess.. The four members have been pulled into his realm by a rift, birthed by a higher force of dark magic. He has them in his grasp. What will happen next? What is this higher force? Play to find out. Special thanks go to: EmibusHD, Jackdaman, Ericzane101, Firephoenix21xt, Mallows, Chikirri, DragonTamer10, and Glow001. Level 2------- After exploring, maybe finding easter eggs, just go back to bed. Level 7-------- Go Right, Down, Left. Sorry for the inconvenience. Level 8-------- Mouse click to fire. Sorry for the slippery controls.